It’s all fun and games until someone flashes some vag. At the wrong guy. DeeDee looks like a 53 year old and Bill went overboard with the fake tan. Bill looks kinda like Donald Sutherland. Damn, what a jacked up cover! When I first looked at this, I thought they were both wearing terry cloth bathrobes. Are they? Good recap, but this one sounds dull as dishwateter. 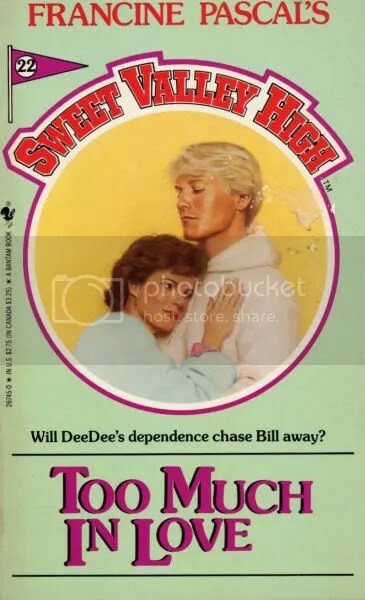 I’ve heard the title before, but I don’t think I’ve ever read it, and for some reason I thought Too Much in Love seemed like a title of a Liz/Todd or a Liz/Jeffrey book. I think someone mentioned before how often the word ‘love’ is mentioned in the titles of these books(ex. Double Love, Are We in Love?, When Love Dies….). You’d think they’d be romantic, but they never are. Exactly, and of course, most of us who read these books grew up believing that these characters’ convoluted shallow relationships were what real ‘love’ was supposed to be like. Is Bill wearing a hoody, two decades before hoodies became so popular? What is up with his face? He looks all shiny and plastic. DeeDee is scaring me a little, she’s got the look of Alex Forrest about her. Ihatewheat, congrats for actually managing to finish this book AND come up with a recap that’s still funny. It sounds like the ghostwriter wasn’t even trying with this one. And I’m sure Alice would be really happy to learn that somebody twenty years her junior can do her job better than she can! What the hell is that pink thing on DeeDee’s sleeve? I can’t tell if it’s a big wad of gum or somebody’s tongue. Also, Bill looks like his entire body, including the hair, has been shellacked. Do you think it could be a scrunchie! I think that the big pink thing around DeeDee’s wrist is a huge 1980’s Swatch. Ha Ha Ha…A 1980s Swatch. It could be, but I think it looks like she’s wearing a long-sleeved pink shirt underneath that blue one. Boy, those colors really go well together, don’t they? A bold eighties statement of contrasting colors! Hey, Alice! There’s this fantastic new invention designed to keep valuable, one-copy-only paperwork safe–it’s called a FOLDER! Jeez, woman, you’re so paranoid about the damn plans, PUT THE DAMN THINGS SOMEWHERE SAFE. Or maybe she could’ve made a copy before they left if the plans were so important? How does Alice get hired to do anything? Are Spanish-style tiled kitchens that popular in Sweet Valley? HA HA HA! Totally, and I’m sure those sketches were Spanish style too, resembling the Wakefield home. Alice is a one-trick pony, kinda like Mike Brady and his astroturf. Ugh, I just read this one recently and thought it was crap. Even the party scenes were ridiculous, with Winston doing magic tricks in the corner. Lila rolling around on the couch with her boyfriend was somewhat amusing though. And yeah, DeeDee’s eyes are all weird on the cover of this one. DeeDee should have taken lessons from Jessica and go make out with like 10 dudes at the party, or better yet, steal Patty’s boyfriend. That would have shown Bill and made him come back. As if DeeDee would ever help a Wakefield, after the crap Jessica pulled during Splendor in the Grass! I read this one but I don’t remember the party scene. I guess I skimmed over it. I am sure I would have remembered beer in Sweet Valley at a place other than Kelly’s or the Shady Lady. Doesn’t DeeDee make an appearance designing tee shirts with puffy paint and Jessica tries to steal them or something? Or was this another generic character? omg. LMFAO. you are amazing. I love this blog -pure genius.